This isn't exactly a pure music post, but one to explain the lack of "pure music posts" over the last few days. 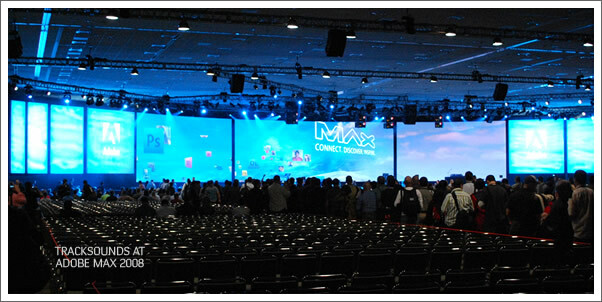 You see there was this "little" conference in San Francisco that I had the privilege to attend: ADOBE MAX 2008. This is Adobe's annual "let us wow you while showing you why the software you bought from us only 18 months ago is now...an antique." I was wowed and enraged all at the same time. As you might expect, those are two very intense feelings and so one might expect that I'd be a little tuckered out. Sure enough...I am. Not to mention, I've been up over 36 hours straight now. Not to mention, that Delta Airlines has now become the absolute worst air carrier in the history of human flight. They are quite simply a joke of a company and I will do everything in my power to keep my Coleman-dollars out of their greasy little pockets for the rest of my life. (No Delta, I don't want any of your useless Delta-dollars either!). Ahem...anyway, let me make this post somewhat relevant. Suffice it to say that some of the incredible technologies shown at Adobe Max 2008 this year will play some roll in the next generation of Tracksounds. Oh for the time, to design and develop all of this! To close, just a little shout out to all the great people I met at Adobe Max 2008, who just might be reading this post!